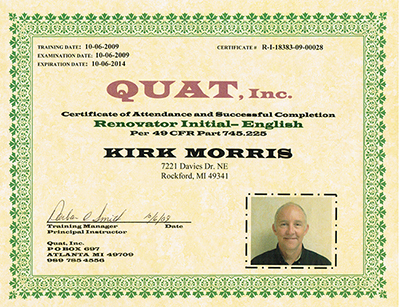 Lead Certification – Morris Builder's Inc.
RRP stands for Lead Renovation, Repair and Painting Rule. The RRP ensures the risk of lead contamination is lowered by requiring firms like ours to be trained by the EPA to follow lead-safe work practices. Luckily for you, Morris Builders, Inc. is in fact certified with the EPA! The principal part of Morris Builders, Inc. is the remodeling of current spaces which more often than not has us running into issues with lead paint. Prior to 1978, lead was added to paint products to help speed up the drying time, increase durability and resist moisture. Although effective in these areas, it can cause nervous system damage, stunted growth and delayed development in children, kidney damage and reproductive problems. Thankfully, the U.S. banned lead based paints in 1977 along with many other household items and children’s toys. Though we are no longer painting our homes with lead based paints, renovations and repairs in older homes often create hazardous dust situations and because of this, the EPA enforced the RRP Rule.